Create Embellish Adore: Another wish for spring.. The month of December was pretty bad for what I call.. seasonal illnesses.. we had such warm weather in November that it wasn't until December when people really started showing signs of colds, sinus issues of whatever side... and yes a few of them had the lingering H1N1 flu. 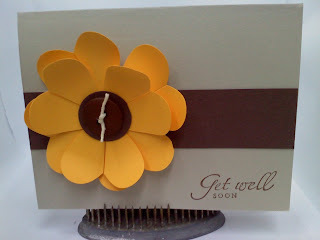 Not everyone can enjoy flowers, so a flower on a card will just have to do. I used the Heart punch, glued the tips down on a 1 3/8 circle and then cut the heart in half. I like the look!